Hello Breakfast! 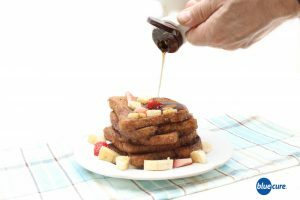 Here’s a new (healthy) take on french toast that’s loaded with so much flavor— you may even decide to skip the maple syrup! If you’re mornings are busy, make a batch the night before or over the weekend. Store in the fridge and toast or reheat in the morning! Quick, easy, delicious breakfast in just a pinch! *start with less cinnamon, add more if you’d like. Put plant-based milk, pitted dates, vanilla, cinnamon, and ground flax seed in a blender. Mix until smooth and then pour into a flat bowl (or bowl large enough to fit a slice of bread). Warm a griddle to 300-325 degrees or use a skillet at medium heat. *You may need to lightly oil the skillet with coconut oil or avocado oil. Dip the bread slices into the date mixture- be sure to coat both sides. Place it on the skillet/ griddle. Brown one side and then flip to the other side until brown. Be sure to watch it so it doesn’t burn. Repeat until all slices are coated and cooked. Top the french toast with cashew cream, nut or seed butter, or a splash of pure maple syrup. Serve with fresh berries and/or banana slices.